As the The New Orleans Convention Center moves forward with plans for expansion–a plan that relies on a great deal of tax-payer dollars and other incentives offered on the backs of the citizens of New Orleans, The Tribune’s 300 in Black installment for this edition include a set of stories published 29 years ago in November 1987 that examined the state of the city’s then-burgeoning tourism industry and how Black New Orleans fit (or not) into the equation. During the past year tourism has often been suggested as the most likely cure for the economic decline that has plagued New Orleans since fiscal year 1984. Tourism is now the third largest Industry in Louisiana, following the Port of New Orleans and the oil and gas Industry, and reportedly generates the largest, most rapid return on dollar investments. The Greater New Orleans Tourist and Convention Commission estimates that nearly 6 million US international visitors annually spend up to $2 billion In New Orleans. The legislature allocates one-half of one percent of collected state taxes for tourism and travel promotion. This translates into $1.2 to $1.4 million dollars in state monies directed to the GNOTCC, which has been the city’s official tourism agency since 1960. An additional $185,000 in city funds, and about $600,000 in private memberships add up to a $1.9 million annual budget. GNOTCC figures show as much as 85 percent of all tourism-derived profit is distributed among the city’s large hotels and restaurants, the airline and tour companies, and downtown retail businesses. The remainder is directed to goods and services-related businesses. But the evidence shows that the Black business community receives little or virtually none of these tourist dollars. Oliver Dyer, deputy director of the Mayor’s Office of Minority Business Development, reports a total of 3600 local Black-owned businesses and estimates that the largest numbers of these are service-industry related. The service industry includes restaurants and nightclubs as well as the vending and catering of foods and supplies, provisions of laundry and cleaning, security, clerical, transportation and other contractual services. Although most blacked owned establishments are located outside the French Quarter-CBD-Garden District area, to which actual tourist flow is directed, location is not a consideration for provision of goods and services if contracts can be obtained. Clarence Barney, director of the Urban League of Greater New Orleans, sees the concentration of Black businesses in the service industry as one step toward broader Black participation in the tourism industry. With this in mind, representatives of the local Black business community met with the Urban League in 1985 to determine some means of a more equitable division of tourism profits and redirecting tourism-generated dollars into the Black business community. As a direct result of that meeting, The Greater New Orleans Black Tourism Center (GNOBTC) was established. Organized as a non-profit agency, the GNOBTC has been in operation since July 1986. As with the Greater New Orleans Tourism and Convention Commission (from which the Black Tourism Center received initial funding), total funding includes state and city monies as well as private memberships, these range from a $100 Annual Business membership to the $5000 Lifetime Corporate Membership. There is also a $50 Individual Membership. GNOBTC members are entitled to attend professional workshops and seminars hosted by the agency and receive select business discounts, job clearing, house information, convention listings, agency quarterly newsletter, and are given opportunities to meet and network with other Black business representatives. Asked to identify specific problems which have prevented Black businesses from full participation in the past, GNOBTC executive director Nadir Hassan cites an absence of Blacks in management positions within the industry itself and a lack of marketing and advertising expertise on the part of existing small Black businesses in the service Industry. According to Hasan there is a tendency on the part of Black business to neglect professional marketing altogether and to rely heavily on word-of-mouth advertising and established reputation. This is particularly true in New Orleans where many Black businesses are family-owned and operated and have been conservatively managed over a number of generations. Hasan sees the tourism center as operating in a facilitating capacity for such businesses, providing guidance and helping prepare Black businesses to compete for bids and contracts. Still in its development stage, the tourism center has earmarked 15 to 20 percent of its $125,000 operating budget for its own marketing program. It has not yet, however, begun a high visibility promotional campaign. The Greater New Orleans Tourist and Convention Commission produces a series of multi-lingual brochures focusing on New Orleans attractions, a seasonal calendar of events, a slick press kit and other printed materials. None of these include information on Black New Orleans or Black community events or in any way promotes Black businesses or entertainment. In fact, there is no indication of a local Black presence in any of the material generated by the government-funded agency. Not only is there an absence of Black representation in the current New Orleans tour and travel package , but overt racist stereotyping of Blacks had been part of New Orleans’ promotional packaging since the 1960s. In an effort to sell New Orleans as a southern paradise, sense of plantation life in which Blacks are depicted as happy slaves, as well as miniature porcelains and life-sized stuffed dolls of mammies and grinning sambos, depictions of Black children as mindless pickaninnies, and post cards, prints and posters representing Black men and women as shiftless and happy-go-lucky, can still be found in windows along Canal or Royal street today. Beverly Gianna, director of public relations for the Greater New Orleans Tourist and Convention Commission, states that she recognizes the damage done to Black New Orleans by those stereotyped Old South images so intrinsic a part of the city’s marketing image in the past. She stresses that the present-day trend among whites in the tourism industry is to see and promote New Orleans as “Old World European” hence the absence of any Black representation. Gianna says that she only recently learned of the growing Black tourist market and expresses her agency’s desire to tap that market. She admits, however, that neither she nor anyone else on the agency’s fifty-person staff is knowledgeable about Black New Orleans culture and history or knows how to appeal to a Black tourist market. And she stresses her support of the Black tourist center to which her agency initially channeled approximately $87,000 in seed money. 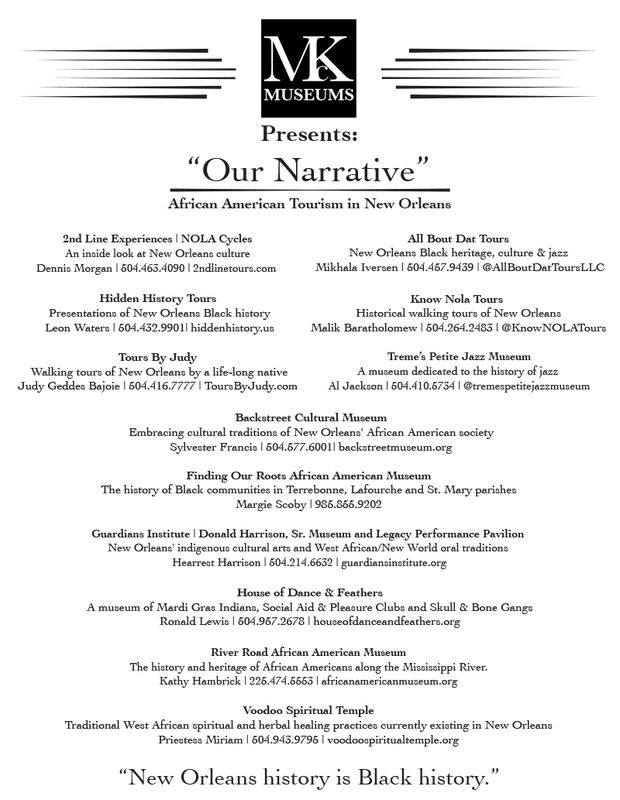 Ironically, the unique cultural atmosphere which makes New Orleans a desirable tour and travel destination is the direct result of the cultural traditions and expressions of its majority Black population. The importance of Congo Square and the Treme as the stomping-ground of early jazz, the distinctive Afro-Latin and Caribbean spirit of the carnival season, the traditional marching brass bands, the ongoing parades and open air festivals, the second-line, jazz funerals, Creole cuisine, and regional peculiarities of speech, song and dance, are all cultural products and expressions of Black New Orleans. Tom Dent, director of the New Orleans Jazz and Heritage Foundation, states that it is not enough to recognize New Orleans Black cultural presence. He suggest that the city be marketed as a Black cultural site if the Black community is ever to benefit from the current tourism surge. Says Dent,“Black tourist and convention groups do come to New Orleans. That’s not the problem. But once they’re here, it’s imperative that they be directed to the services, products and venues of Black-owned companies. “Otherwise Black New Orleans will never see a profit from tourism. Also, Black tourists must be exposed to our rich cultural life. They should be well informed as to immense cultural and political impact of the African presence in New Orleans and directed to the many historic sites of local, regional and national that high Black history and culture. Along these lines, two major obligations of the Black tourism center associates have developed business ventures rooted in New Orleans Black history. Toni Jones is the owner of a tour and travel company Escape with Travel. Inc. Her company offers a four-hour Black heritage Tour of New Orleans. Toni Jones counts a number of Orleans Parish schools as well as private business groups, clubs and social aid and pleasure groups among her customers. “Business has been going very well for me,” she says “I only hope I can keep up with the high demand for information on Black New Orleans.” At present Jones is preparing a slide presentation which she plans to include in her tour presentation. While it is true that the tourism industry has changed considerably over the last 20 to 25 years and has recently expanded to include some minimal Black participation in the service industry, to date it has done little to address widespread poverty among Blacks in New Orleans. And while the most recent figures show unemployment in New Orleans decreasing (9.1 percent, down from 9.5 percent in June of this year), the figures for Black New Orleanians are harsher, Blacks, who constitute more than half available work-force in New Orleans (52.75 percent), comprise 15 percent of the unemployed. According to U.S. Department of Labor reports released this spring, unemployed Black constitute 76.6 percent of all applications on file with Employment Security in New Orleans. At that time, 20,000 Black new Orleanians were reportedly out of work. As bleak as they seem, such figures are conservative. This count does not include: those not registered with Employment Security, teachers and school employers out of work during the summer months, the self-employed who contract on a minimal services or project basis and are, therefore, mostly unemployed, the discouraged unemployed who have given up hope of finding work, or school-aged youths seeking summer or first-time employment. More than one-third of the city’s Black population maintains below poverty-level living standards. And Black New Orleanians earn a median income of only $10,500, as compared with a median income for local whites of $21,500.